On Sunday 19th March the St Ivo Squash Club Championship took place at One Leisure Outdoor centre. Strong performances from up and coming players, Sean and Harry, weren't enough to progress in the competition. In the opening round Steve started strongly giving Rich little chance, but in the next round Dave gave Steve a scare in a close battle before Steve progressed. Matt started well against John but did not have enough to trouble the defending champion, although he played some excellent attacking squash to win his other two matches. And so to the final, a close battle saw John beat Steve 3-2 in one of the best finals of recent years. Thanks to all participants, Alistair and John for the prizes, and One Leisure for helping with the courts. An excellent turnout saw the best players in St Ives converge on the outdoor centre for a one day, winner takes all, shoot-out for the crown of St Ivo Squash Club Champion. As the clock struck 2pm, matches commenced, pitting the promising Harry Aldridge and the hyper kinetic Danny Caulkett Snr against the new kids in town, Rich Dewis and Marco Pita. Harry beat Rich in a close contest, and Marco signalled his intent to go for the title by quickly dispatching Danny. The other first round match saw Danny Caulkett Jnr see off Sandy McGregor in straight games. The Quarter finals had some tasty draws, none more so than Dave Chapman against Danny Caulkett Jnr. Caulkett started like a machine gun, firing winner after winner to take the first game. Dave raised his game, and by the end of the match had taken a tight contest 2 games to 1. Marco played Matt in the next quarter final. On paper this was a tough match to call, but Matt’s better length game won the day over Marco’s high intensity. Next up was Nick Giles and Alistair Paul; not proper surnames, but the two players with the best squash technique in the club. Giles went through in straight games. Finally, in a tough game, four time champion John Dewis avenged his brother’s defeat by dealing Aldridge his ticket home. On to the semi finals. The four top seeds. Who would blink first? Clearly, from the cries of anguish echoing through the Ivo, Matt Dixon would. On paper Giles versus Dixon should have been an epic. In reality, Giles stepped up to a higher gear and Dixon, the perennial runner-up hoping for another shot at the title, was left floundering as Giles won in straight games. In the other Semi-final, John Dewis cruised through, beating Dave Chapman 2-0. Chapman wasn’t at the races after a tough quarter final, and Dewis was in the mood to finish it quickly to avoid any fitness issues. The final. Best of five. Seeds one and two. One gold plated trophy. Giles looked like he meant business, a steely gaze on his face as he served to start the match. He wasn’t going to surrender to the four-time champion quietly and took the first, Dewis struggling against some excellent length shots. The second was a tight game, Giles just went for one too many winners at the business end of the game and it was all level. At first it appeared a minor setback for Giles, but psychologically the man was hurting. He’d raised his level and lady luck wasn’t with him. Uncertainty spread through his game and Dewis knew he was in the ascendancy. Ten minutes later Dewis wrapped up the match, and raised the trophy for the fifth time. The ladies final was another good contest between Jayne Ingram and Angelika Peters. Jayne had the best of her rival this year and took her fifth title in straight games. In the plate, Sandy McGregor showed some canny shots in losing to Rich Dewis. Alistair Paul progressed through after beating Danny Caulkett Snr. Paul was favourite for the final, but Rich Dewis showed great improvement in the final, raising his game to a whole new level to take the plate title in straight games. Thanks to all for playing, and also thanks to everyone for coming for a curry after the championship. Mens Plate: Winner Alistair Paul, R-Up Danny Caulkett Snr. Mens Plate: Winner Sandy McGregor, R-Up Chris Rayner. 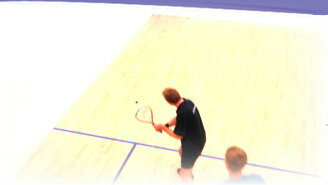 The Finals day for the 2012 St Ivo Squash Club Championships was held on Sunday 17th June 2012. Ten players had survived some tough matches in the preliminary rounds earlier in the week, but there were more gruelling matches to come as they battled it out for squash glory in the unforgiving heat of the Outdoor centre. First up were the semi finals of the plate, with Michel Sedgewick taking on Alex Curtis on court 2 and the evergreen Sandy Mcgregor pitting his wits against Mark Enzer on court 1. Some fierce drives were the hallmark of the Curtis-Sedgewick match. Alex was the pre-match favourite and raced into a 2-0 lead in games as his opponent started slowly. Michel started to play his shots in the third game and it could have went either way, but Alex saw out the match to win 3-0. The McGregor-Enzer game saw a contrast of styles as the energetic Mark raced around the court, putting Sandy under pressure for every shot. At one game all it was hard to call a winner, but then Sandy demonstrated some exquisite trickle boasts to which Mark had no answer. Sandy won the match 3-1, treating the crowd to his full repertoire of canny shots. Next up were the men's semi-finals. On court 1, Nick Giles faced Matt Dixon, while David Chapman took on John Dewis on Court 2. The match between Nick and Matt turned into a war of attrition as Nick's attacking game met the incredible work rate and defensive retrieving of Matt. The first couple of games lasted approximately 45 minutes and at one game all both players, and marker Sandy, were looking at a long night. However, a longer match played into Dixon's hands as the older, yet less folically challenged Giles, tired. Matt saw out the match to win 3-1. On the other court, Dave Chapman and John Dewis played attacking squash, aware that Matt and Nick were using up all the court time. The warm courts played into John's hands as Dave's volley kills were negated by the bouncier ball. Dave rallied in the third game but John held on to see the match out 3-0. The ladies final saw the familiar clash of Angelika Peters playing Jayne Gostelow. A second clash took place between their illuminous green tops, and marker Dan's eyes will hopefully make a full recovery in time. Angelika won last years final against Jayne, but it was always going to be a hard match to call as Jayne has been playing well, notably going unbeaten through the team squash season. Jayne took a 2-0 lead but the games were getting closer. In the third game Angelika looked to have found her form, racing into a commanding lead. Jayne was spurred into playing some attacking drives, and some excellent backhands saw her win the game 9-7 and take the championship. The Mens Plate final saw young gun Alex Curtis take on the slightly more experienced Sandy McGregor. In a cruel twist of fate, a scheduling mishap (complaints to organiser Dixon please) left Sandy playing two matches in close succession. It was going to be an uphill battle but Sandy showed some flashes of brilliance to keep the outcome in doubt. Alex responded by raising his game to finish the match off and win the Plate trophy, playing some excellent squash in the process. The day culminated with the Men's final between Matt Dixon and John Dewis. Dixon's confidence was high after his semi-final victory but 2009 champion Dewis was favourite going into the match. John won the first game 9-6 looking relatively untroubled. Matt responded by winning the second game and the match was in the balance with Matt looking like the fitter player. Looks can be deceiving though and John won the third game to love before racing into a 5-0 lead in the fourth. The indefatigable Matt then played some of the best squash of the match to go 6-5 up, before John summoned up one final effort to finish off the game 9-6 and win the Men's title 3-1. Thanks to Matt Dixon for organising the competition, all the players who took part, and Karakal for providing t-shirts for the winners. Clockwise from top left: Action from the men's final, John receives the trophy from Brian, Jayne and Brian are both required to lift the ladies trophy, Organiser Matt presents Alex the plate trophy. The 2011 Club Championships took place over the weekend of 21st-22nd May. Thanks to all the participants for making it a fun weekend. Some excellent squash was played and many of the matches were closely contested. The ‘B’ plate final was an epic contest between Angelika Peters and Mike Tidball. At two games all going into the final game it was hard to predict a winner. Mike started the game well but Angelika played some great lob shots into the back corners, taking the final game 9-5 to win the match. In the ‘B’ final there was another close match between two of the clubs up and coming players, Alex Curtis and Nick Bach. Alex started strongly using some tricky boast shots to take the advantage in the first game. The second game was close again but Nick started to read the game well and got some great shots back to level the score at one game all. Nick kept the momentum going and though Alex played some great shots , Nicks brilliant retrieving proved too much for a tiring Alex and Nick won the match 3-1. The ‘A’ plate final was between Matt Dixon and Howard Mitchell. Howard started strongly and was covering the court well. Howard raced into a one game lead, cutting out many of Matt’s drives with some excellent volleys. The second game proved decisive. Again Howard started well, and built up a substantial 7-1 lead. Matt started finding the corners with some good drives and pulled the game back to 8-8. In a tense few points Matt prevailed and pulled the match back to one game all. The momentum had swung in the crucial second game and Matt closed out the match to win 3-1. The ‘A’ final was a repeat of the 2010 final with the reigning champion Jack White taking on the 2009 winner, John Dewis. Although the first game was in the balance, Jack proved too strong for John and closed out the match 3-0 in record fast time. The Ladies final was another great match in the catalogue of finals between Angelika Peters and Jayne Gostelow. Jayne started the match brilliantly and looked like moving into a 2-0 lead before Angelika moved up another gear and took the second game to level the match at one game all. Jayne started the third game well but Angelika again picked the pace up and took the game before closing out the match 3-1. Thanks to Matt Dixon for organising the competition and well done to everyone who took part. The mens final took place on Friday 21st May at 8pm between Jack White and John Dewis. White won the match 3-1 to be crowned mens champion for the third time. The ladies final was won by Jayne Gostelow following an excellent match with the 2009 champion Anjelika Peters. The Mens plate was won 3-2 by Bert Francis in a close match with Alex Chapman. The doubles final was won by John Dewis and Alex Chapman after a closely fought 3-2 victory over John Corbett and Bert Francis. A special mention is due for Matt Dixon who was unable to partner John in the final through injury. The 1st game was a rapid one, the fast starting Craven taking an early lead with some delectable shot making and fierce nicks. Craven took the 1st game comfortably with Dewis only getting a hand full of points. The game interval was spent in entirely different fashions, with Craven falling into a chair, while Dewis was running around court hitting balls!! The 2nd game saw a turn in the tables with Dewis coming out strong and causing Craven all sorts of problems. Craven became impatient and started going for too many shots which ended up in a few unforced errors. Dewis taking the game 9-0 in quick time. The break in the games gave Craven time to ponder the previous game, Dewis stayed on court hitting balls again; the ball was like a hot potato! The 3rd game from the word go was a much tighter affair, with both players trading points. The tempo was raised and both players played some of the best squash of the match which resulted in some gargantuan rallies!!! Until just after the half way point in the game it was nip-tuck, then Craven gained the advantage with a string of very tight cross-courts. Eventually going on to take what was a very tight game. The 4th game was a very similar affair with players trading points. Both were now starting to feel the pain and errors were creeping into their respective games. However, again, just after the half way point the advantage was gained. This time it was Dewis who capitalised on some opportunities with some good volleying, eventually taking the game and forcing the match into what it deserved, a fifth and final game. All season Craven was known for his thrilling 3-2 victories which stood him in good stead for this one, the one he wanted to win the most. But the fitness of Dewis may be the deciding factor. Both players traded points at the start of the final game, neither wanted to give anything away, with more stylish shot making from Craven equally matched by the fitness of Dewis. In the end fitness told with Dewis able to stretch his advantage to a sizeable lead, eventually taking the fifth game 9-4 and the match 3-2 in a 90 minute marathon; which made him the St Ivo club Champion 2009!!!!! Craven was gracious in defeat and afterwards admitted that Dewis had the legs over him. Three nights before the final it was not a certainty to happen as the team night out took place in St Ives with Mr Dewis shockingly having one (or 5) too many beers!! However he recovered in time to put on a show of sheer determination to come out on top. I would like this opportunity to thank everyone for participating in the tournament itself. Some quality squash was played by all and next years championships should be a tight affair with Craven out for revenge!! Also thanks to everyone for turning up on the final night and showing their support, it was a privilege to play in such outstanding company and you helped it make the historical sporting spectacle it turned out to be. Last of all a big congratulations to John Dewis, St Ivo club champion 2009!!! Match report written by Richard Craven (runner up 2009). Congratulations to Anjelika Peters who beat Jayne Gostelow in the final.